The Philippine Ballet Theatre (PBT) was founded 1986 during the aftermath of the EDSA Revolution. The company was formed as a response to the clamor to support ballet artists and their respective companies that felt left out by the Cultural Center of the Philippines (CCP) during the Marcos regime. The CCP Dance Company was the sole company that received support during the Marcos era. In 1986, during the first Aquino Administration, after the political tempest of the EDSA Revolution, a meeting with the CCP's new administrator Ma. Teresa "Bing" Roxas and Nicanor Tiongson was held at the Silangan Hall. All Of the nation's leading dance artists were invited. The (P agreed to give minimal funding and a seasonal home to the fledgling group at the Tanghalang Nicanor Abelardo. 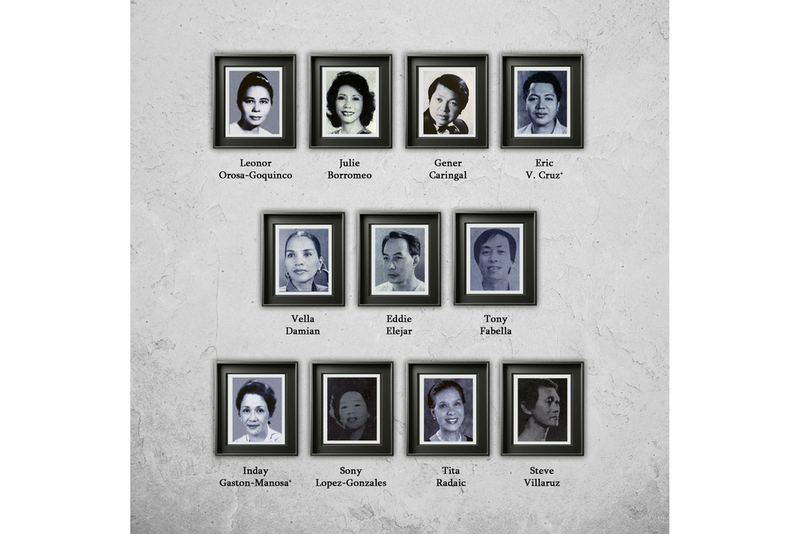 The new company's founders were National Artist Leonor Orosa Goquinco, Felicitas Radaic, Julie Borromeo, Eddie Elejar, Maria Luisa "Inday" Gaston Manosa, Sony Lopez-Gonzales, Vella Damian, Basilio Willaruz, Gener Caringal, Tony Fabella, and Eric V. Cruz. Goquinco integrated with the Festival Four, and with all of them combined, PBT was born. provided their vision, hearts and souls, as well as the talent, performing artists and costumes that made PBT the renowned classical ballet company in the country that it is today. The company's first studio was at the Classic Ballet Academy of Inday Gaston-Maiosa in Makati. In 1989, the group was invited by the Lopez Group to move to Meralco Theater in Pasig. After PBT was formed, Mita Bantug Rufino and Gloria Angara subsequently joined the organization, as well. Throughout the years, PBT's goals evolved into striving for the preservation and showcasing of classical full-length ballets, the commissioning of Filipino heritage masterpieces, and bringing to the forefront the extraordinary talent of Filipino artists, not only as performers but also as choreographers. In this endeavor, PBT has supported many talented youth with training through scholarships from the support of its many generous benefactors. Alongside PBT's Board of Directors is its Artistic Council, composed of directors from affiliated schools and companies. The Council helps select the dancers that compose PBT's roster of artists. Among its founding members was the late National Artist Leonor Orosa Goquinqo. Throughout the years, PBT's esteemed Artistic Directors has included Inday Gaston-Manosa, Julie Borromeo, Eddie Elejar, Gener Caringal, and its current director, Ronilo Jaynario. Notable ballet and rehearsal masters include Vella Damian, Sonia Domingo, Nida Onglengco-pangan, Wu Zhen Rong, Rinat Gisatulin, Nicolas Pacafia, Sofia Radaic, and currently, Anatoly Panasyukov who has served the longest and has helped restage many ballet Classics for the company. Throughout its three decades of existence, PBT has created some of the finest dancers, choreographers, and artists in the country. Like a mother, proud of her progeny, the company has influenced many of the prominent companies and artists in the industry today. Like a big oak tree with deep roots and sprawling branches, PBT, with its affiliate schools, has sent their performing artists far and wide into the industry. The Quezon City Performing Arts Development Foundation, University of the East, University of the Philippines, and others have, in turn, lent their dancers to PBT. The Philippine Ballet Theatres triumph over daunting obstacles and hardships is a celebration Of the company; resolute spirit that continues the revolutionary fighting spirit of its founders. Bold, Brave, and Beautiful, the company, and all the people behind it, continue to dream and fight, striving to see their dreams come to reality. Giselle (1988), Coppelia staged by Basilic and Sonia Domingo (1988), Les Sylphides staged by Basilio Domingo (1988), la Sy/phide staged by Harold King and Susannah Jane Leach (1991), Don Quixote staged by Nicolas Pacaha (1993), Swan Lake staged by Sergei Alexander Bykov (1994), 10 Bayadere (2004), la Esmeralda (or The Hunchback of Notre Dome) staged by Anatoly Panasyukov (2006), The Nutcracker Ballet staged by Michael Chernov and Gelsey Kirkland (2010), Cinderella by Jean Paul Comelin (2011), and Corsaire by Francis Le Comb, after Marius petipa (2013). (1990). Jiang Zuhui did his New rear's Sacrifice (1987), Li Chen Xiang set Dreams of the Red Chamber, and Farewell to Maria Clara in 1990. David Campos Canteros Carmina Burana to Carl Orff (2003). Thomas Pazik has created the most number of foreign works for PBT — Romeo and Juliet for Manlya Barredo and Nicolas Pacaha (1990), and Madame Butterfly (1991). Original ballets created by Gener Caringal for PBT include Andres KKK, Pilipino Komiks, Darangen ni Bantugen, Haram, Vinta, Prosm, The Tribe, and Bughaw. Other choreographers that contributed new work for PST include Edna Vida, Paul Morales, Myra Beltran, Tony Fabella, Eddie Elejar, Felicitas Radaic, Julie Borromeo, Denisa Reyes and Ronilo Jaynario, among others.